PHOTOQ Melbourne can transfer almost any film format to DVD disc, file or hard drive. 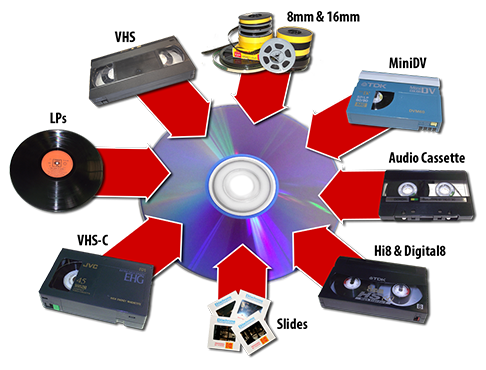 We transfer VHS tapes, VHS(C), SVHS, 8mm, 9.5mm, 16mm, Digital 8, Video 8, Super 8, Hi8 and Mini DV, Umatic, Reel to Reel and Betacam to DVD disk, file, hard drive or Blu-ray Disk. We are now offering standard or high definition frame by frame scanning of super 8 and standard 8 telicine film. We can even transfer your old audio tapes and Vinyl LPs to CD. If you live outside of the greater Melbourne area, please click here. We specialise in domestic home movie transfers and we also work with Schools, Universities, Government Departments, Small and Big Businesses. We also take orders Australia wide: VIC, NSW, QLD, WA, SA, TAS and NT. Q: Do you have home movies on camcorder tapes that you can't watch because the camcorder doesn't work? Q: Is your wedding video on a VHS tape but you can't watch it because you no longer have a VCR? Q: Have you got hundreds of slides of your children or when you were a child but the projector is broken? Q: I'm not in Melbourne, can I post my tapes tapes to you? YES! Click here to find out more! Bring them in to us here at PhotoQ and we can transfer your home and family movies to DVD, using the latest technology and professional authoring software to produce the best possible DVD for you. We can also convert your movies into a movie file that can be edited with your home computer. Supported movie media include: 8mm, 16mm, 9.5mm, VHS, VHS-C, Video8, Hi8, Digital8, MiniDV, Beta and Umatic. We can also scan your 35mm slides onto CD or DVD so you can enjoy them once again! So please don't hesitate, give us a ring on 03 9855 0006 and we will be able to give you an instant quote. VHS would have to be our most popular format by far! 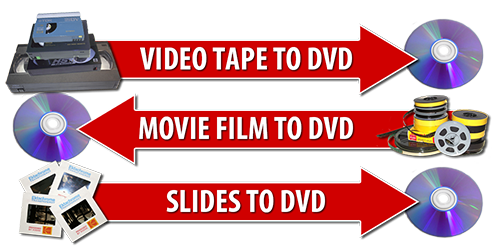 VHS was introduced in 1976 and by 1990 was the standard video recording format for home users but in 1997 DVD was released and it only took a few years for it to take over. Compared to the high resolution of DVD and HD that we are used to now they are quite low quality, so don't be surprised if your home movies don't look as good as the latest Hollywood blockbuster. We can also digitize SVHS & SVHSC tapes. Our Regular 8 and Super 8 film transfers are completed using brand new state of the art frame by frame film scanning technology. Every single frame of your film is captured separately and then a flicker free colour enhanced movie is created. Our technicians monitor your film as it transfers and adjust for colour, density and sharpness. We can even offer Standard 576p or High Definition 1080p files saved to your hard drive or we can provide one for you. We are currently commissioning a frame by frame 16mm film scanning machine! While our current 16mm transfers are great, they are about to get even better! 16mm film will soon be available in standard 576p, 720p or 1080p High definition files. We are currently also commissioning a frame by frame 9.5mm film scanning machine! Compact was brought out in 1982 and was designed to be the compact version of VHS and actually uses the same magnetic media as VHS, only in a more compact form, this made the format very popular because it allowed people to use an adapter to play the tapes directly onto their VCRs, this feature alone made it more popular than Video8. Here at PhotoQ we have dedicated slide scanners that can turn your old 35mm slides into brilliant digital images, perfect for sharing with the family online or printing. Some of your old slides may have shifted colour over the years but don't despair, we have full control over the colour during the scanning process and can often restore your long forgotten memories to like new. Mix tapes were the best weren't they! Playlists will never replace a good mix tape, maybe you made one for a road trip or maybe you made on for your girlfriend. The Compact Cassette as it was known was introduced in the early 60s and had a good run until the early 90s when CDs came out. We can put your audio cassettes and reel to reels onto CD for you. I'll never forget the day my walkman ran out of battery and Kylie Minogue sounded like Rick Astley. We even to 8-track. Who hasn't got a couple of these babies laying around the place? You just can't beat the sound and they don't quite sound the same on MP3 do they? Maybe you still listen them? Maybe you want to listen to them in the car! Vinyl records were first introduced back in the late 40s and (apparently) left the mainstream in 1991. We can transfer your old (or new) 6", 12" & 78s to CD so you can enjoy them again or maybe just more conveniently. There is so much more that we can do for you, so don't hesitate a moment longer, give us a ring on 03 9855 0006 or drop in and we may be able to help. Click here to download and print our postal order form.